Members of the Fairfield Junior Women's Club with a sample of their $9,000 check to benefit the "One Book, One Town" program. FAIRFIELD — The Junior Women’s Club of Fairfield welcomed two special guests to its January general meeting. Danielle Sharp, Director of Development for The Friends of the Fairfield Public Library, along with Jacqui Coghlan, President of the Friends of the Fairfield Public Library, were invited to receive a check for $9,000, designated to help reinstate the Fairfield Public Library’s beloved One Book One Town program. One Book One Town (OBOT) is focused on a book chosen by the OBOT Committee after an exhaustive selection process, combined with programs and discussions planned with the selected book in mind. The entire Town of Fairfield is encouraged to read the book and join in and participate in the programs and discussions, including a special event with the book’s author, that has traditionally been held at Fairfield University’s Quick Center. Unfortunately, with Library staff shortages and budgetary cuts, The OBOT Committee was unable to plan for the event in 2018. 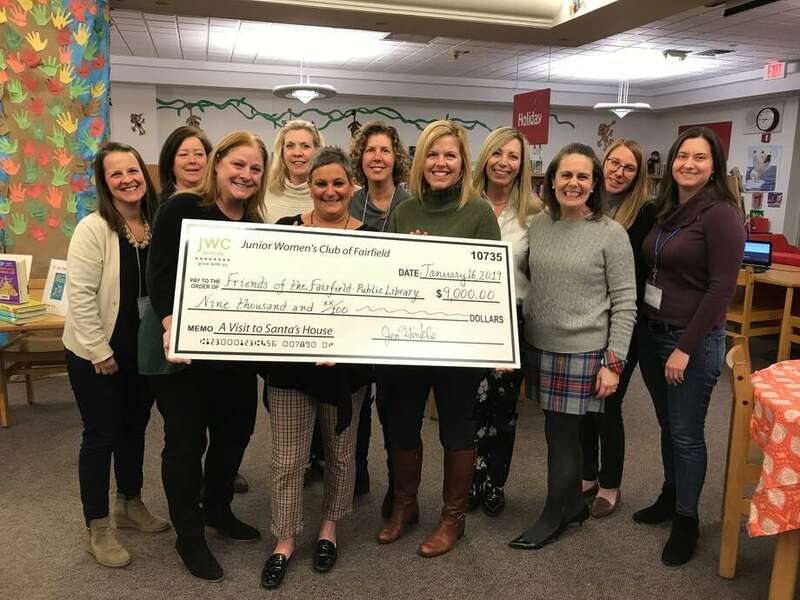 Together, with the Junior Women’s Club of Fairfield, The Friends set the goal to secure the financial support needed to bring the program back in 2019. “We are so grateful for all of the support the Junior Women’s Club has provided since the inception of our partnership - especially for the all of the work and effort put into Santa’s House on behalf of One Book One Town,” says Ms. Sharp. On Jan. 8, the Fairfield Public Library unveiled the selections for 2019 — “Harbor Me,”and for the youngest readers, the picture book “The Day You Begin,” both by award-winning author Jacqueline Woodson. 2019 marks the 11th year of the One Book One Town program. “This year’s Santa’s House fundraiser was one of the most successful in JWC history, and we couldn’t be happier to make this $9,000 donation to support such a valued contributor to the fabric of our town,” states Cheryl Eustace, JWC CARE Committee Co-Chair. Each year, proceeds of JWC’s Santa’s House are donated to the club’s CARE (Consideration And Respect for Everyone) partner, along with the JWC Scholarship Fund. The 2018 Santa’s House was like no other -- with several new events designed to attract members of the community to this longtime Fairfield tradition. A new spacious performance tent was on site at the Burr Homestead ensuring a theater-like experience to accommodate all ages - including those who attended the special “Nutcracker Night” performance by presenting sponsor Flash Pointe Dance. The festivities also included Holiday Trivia Night for the adults, as well as professional face painting & crafts by Hatter & Tatter and the “Nutcracker Café” which served warm, savory dishes along with sweets for all to enjoy. To transform the Burr Homestead, the JWC once again partnered with local designers, who created an event space filled with holiday cheer and unique designs across several of the rooms. The design sponsors included Black Rock Galleries, Diane Rath of The Rath Project and Dana Ferraro, principal designer, Molly Patton Design. Their creativity and style added a unique festiveness to the Burr Homestead. The club is also grateful for the support of all Santa’s House sponsors, especially presenting sponsor Flash Pointe Dance, Southport Family Dental, Bigelow Tea, Carmody Law, uBreakiFix, Abbey Tent, Fairfield Hobbytown and Saugatuck Sweets. The Friends of the Fairfield Public Library was chosen last spring as the 2018-2019 CARE recipient. Beyond the Santa’s House contribution, the JWC plans to help support The Friends in a variety of ways, including helping with book sale events and providing extra hands at the family-friendly Mini-Golf held in the Spring and the Annual Food Truck Festival in the Fall. Open to women in Fairfield and surrounding towns, the JWC is a non-profit service organization that gives members the chance to make new friends while giving back to the greater community through social and personal enrichment programs, fundraisers, and local events. To learn more about the club, please visit www.jwcfairfield.com . Founded in 2003, The Friends support library programs, promote community awareness of the Fairfield Public Library, advocate for town funding and provide supplemental financial support for programming and services. Over the past fourteen years, The Friends have provided over $300,000 to the library to support special programs, services and resources not included in the operating budget, including a commitment to fund the library’s museum pass program that provides library card holders the opportunity to experience many wonderful museums in and beyond Fairfield County at a significant discount or for free.